16:12 The sixth angel poured his bowl on the great river Euphrates, and its water was dried up, to prepare the way for the kings from the east. It is possible that this image depicting the threat of invasion is recalling an event from history. As we know, in Revelation, Babylon — a past enemy of God’s people — is used to depict Rome — a then current enemy of God’s people. Here we see a dried up river being used to defeat figurative Babylon, and history tells us that ancient, literal Babylon was once conquered by a dried up river. Last week, we mentioned that historical Babylon fell to the Persians without a shot being fired. Instead, as we discussed, there is evidence that certain priests of the false god Marduk thought the current rulers in Babylon were impious and preferred instead the Persians under Cyrus. Thus, we are told that the people, led by the priests, opened the gates to Cyrus, who was then greeted as a liberator. But according to Herodotus, there is more to those strange events. He tells us that when the Persians captured Babylon they did so by drying up the Euphrates river, which flowed right through the center of Babylon. They diverted the river into a lake and entered the city through the dry channel of the river. There were huge brass gates in the walls that flanked the river Euphrates in its passage through the city, and these gates provided access to water for the citizens and could be closed as a defense if needed. But it was these gates that were left open allowing access to the Persian troops after Cyrus had reduced the water level of the river. Just as the actual city of Babylon had fallen by a literal drying up of the Euphrates, the figurative Babylon would fall by a figurative drying up of the Euphrates. The vivid language in Jeremiah 50-51 is a symbolic description of Babylon’s fall. The key verse is Jeremiah 51:64 — “Thus shall Babylon sink, and shall not rise from the evil that I will bring upon her: and they shall be weary.” From an earthly perspective, the end of Babylon may not have looked like much, but that was not the case at all from God’s perspective. The prophecies of Isaiah and Jeremiah had been fulfilled. Babylon was finished as a world power. Her day was done. That was the state of affairs for ancient Babylon described figuratively in Jeremiah 50-51 ― and that is the same state of affairs described by the same language against a different enemy of God’s people in Revelation. Who are the kings from the east in verse 12? Some say that these are the allies of Rome who are pictured as rushing in to her aid. But the text indicates that God dried up the river to help the invading kings from the east. Does that mean they are on God’s side? No. It means only that God is using them for his own purposes as he judges Rome. In fact, verse 14 may show these same kings preparing for battle against God. The greatest enemies of Rome, the one nation she could not subjugate, were the Parthians who lived beyond the Euphrates. Their cavalry was the most dreaded force of fighting men in the world. For the cavalry of the Parthians to come sweeping across the Euphrates was a thought to strike terror in the bravest heart. Did Parthia literally conquer Rome? No. Was an attack from Parthia something that Rome feared and that could be used to figuratively depict some great catastrophe against them? Absolutely, and that is how it is used here. None of the previous bowls literally occurred and this bowl is no different. The purpose of the bowls is to paint a picture of compete and total destruction and judgment, and that is exactly what this bowl conveys. The false prophet is mentioned here and in 19:20 and 20:10. If we compare the descriptions of the false prophet with those of the second beast from the earth in Chapter 13, we will see that they are identical. That second beast from the earth that represents the false religious side of Rome is none other than the false prophet that we see here and in Chapters 19-20. And the beast standing next to the false prophet is the first beast from the sea in Chapter 13. And standing behind each and pulling their strings is the dragon. These three then are assembled against the advancing armies of God ― the dragon (Satan—the power behind Rome), the beast (the beast from the sea—the civil, military might of Rome), and the false prophet (the beast from the earth—the false religious side of Rome). These three form a hideous contrast to the Godhead—the Father, Son, and Holy Spirit. We have seen much come from the mouths of the dragon and his minions. In 12:15 we saw a flood come from the mouth of the dragon. We saw blasphemies come from the mouth of the first beast in 13:5. We saw deceit come from the mouth of the second beast in 13:14. Here we see a foul demonic spirit like a frog emerge from the mouth of each. These spirits perform signs and assemble the whole world for battle. Why are they compared to frogs? Frogs are famous for their empty and continuous croaking. Even today we have the idiom of having a frog in your throat. The sound of a frog is a symbol for meaningless speech, and such speech characterized the speech of the dragon and the two beasts. Once again, there may be a historical allusion ― an ancient writer of the day once remarked that Nero was nearly reincarnated as a viper, but mercifully was allowed to come back as a frog so he could continue his singing! And Moses said unto Pharaoh, Glory over me: when shall I intreat for thee, and for thy servants, and for thy people, to destroy the frogs from thee and thy houses, that they may remain in the river only? And he said, To morrow. Some commentators note that in Zoroastrianism, the Persian religion, frogs were the bringer of plagues and an agent of the power of darkness. Hence, they argue that this symbol may have been attached to the symbol of the kings from the east. In verse 15, a voice (almost certainly Jesus) says that he is coming as a thief! What does that mean? Rome had no idea what was coming. Rome would never have dreamed that they were going to lose. Rome thought it was the eternal kingdom! To Rome this judgment was not only a mystery, but it was a surprise! They were not prepared for it. This judgment would be totally unannounced, and that is something it had in common with the final judgment at the end of the world, which 1 Thessalonians 5:2 also tells us will come as a thief in the night. But this description marks a difference between the judgment of Rome in Revelation and the judgment of Jerusalem in Matthew 24. The judgment of Jerusalem did not come as a thief, but rather was preceded by signs and warnings (something a thief rarely does!). 16 And they assembled them at the place which is called in Hebrew Armageddon. If 13:18 with its cryptic 666 reference is the most well known verse in Revelation, then verse 16 must be in second place. If you ask the man on the street about Armageddon, you will most likely hear that it marks the location of the great battle at the end of the world. But where, I ask, did anyone ever get the idea that there will be a battle (great or otherwise) at the end of the world? That is when every knee will bow to Jesus Christ. There will be no fighting when Jesus returns to claim his own. What is Armageddon? The name Armageddon or Har–Magedon means the Mount of Megiddo. The Bible speaks of “Megiddo and its three heights” in Joshua 17:11, “Megiddo and its towns” in Judges 1:27, “the waters of Megiddo” in Judges 5:19, and “the valley of Megiddo” in 2 Chronicles 35:22 and Zechariah 12:11. Megiddo in Hebrew means “place of troops,” which provides a clue to what this symbol means. Megiddo is located at a height near the edge of the Jezreel Valley, also known as the Plain of Esdraelon (Esdraelon being the Greek modification of Jezreel). The site is located almost exactly halfway between Haifa on the Mediterranean coast to the west and Tiberias on the Sea of Galilee to the east. It was the site where James Michener’s book The Source was based. From its advantageous location, Megiddo controlled one of the most important roads in the ancient world, the Via Maris, which was an international military and trade route that ran between Egypt in the south and Syria, Phoenicia, and Mesopotamia in the north and east. This location gave Megiddo great strategic significance. It was at Megiddo that Thutmose III fought in 1479 B.C. what one scholar has called the first battle known in recorded history anywhere in the world (although he also suggests that Pepi I instead may have had that honor as early as 2350 B.C). It was at Megiddo that the Mongols lost their first major battle ever during their sweep across Asia and the Middle East. This was the plain where Barak and Deborah overthrew Sisera and his chariots in Judges 4. It was in this valley that Gideon’s 300 men defeated the Midianites in Judges 7. Saul and Jonathan were killed at the eastern edge of this valley in 1 Samuel 31. This is where Ahaziah died by the arrows of Jehu in 2 Kings 9. This is where Josiah perished in battle with Pharaoh Necho in 2 Kings 23. That battle was particularly important because this delay of Necho allowed Babylon to defeat the Assyrians and become the leading power of that time. Josiah’s defeat and death paved the way for the Babylonian exile of the Jews beginning in 586 B.C. For four thousand years, this region has suffered almost constant warfare. Indeed, one may seriously ask if there has ever been a time when the rulers of the area, whether local or foreign, were not at war. The turbulent history of all Israel, and Judah, Canaan, and Palestine, is reflected in microcosm in this blood-soaked little valley, for virtually every major invader of Israel has had to fight a battle in the Jezreel Valley. Egyptians, Canaanites, Israelites, Midianites, Amalekites, Philistines, Hasmonaeans, Greeks, Romans, Byzantines, Muslims, Crusaders, Mamlukes, Mongols, Palestinians, French, Ottomans, British, Australians, Germans, Arabs, and Israelies have all fought and died there. Are those pictured as assembling in verse 16 doing so to fight a literal battle? No. It is no more literal than the battle in Heaven we studied earlier. Is it a vivid image? Definitely. Armageddon was the perfect setting for the figurative battle between the Lamb and the dragon. It was the perfect stage for the great spiritual battle between the army of Satan and the army of God. This fight had been brewing since at least as early as Genesis 3. Where would we expect such a battle to be pictured? Wouldn’t we expect the greatest battle to be fought on the greatest battlefield? That is where God shows it to us. We will find out more about this battle when we get to Chapter 19. This seventh bowl poured into the air marks the culmination of the judgment of Rome. At this point Rome’s fate is sealed and its fall is inevitable. The verdicts of historians notwithstanding, the book of Revelation makes it clear that Rome fell because Rome persecuted Christians. Rome’s fall was a divine judgment from God. The most powerful empire the earth had ever seen went up against the church and lost. Note that this bowl is poured into the air, thus completing the cycle through the elements — earth, water, fire (sun), and air. What does the air depict? Ephesians 2:2 tells us that Satan is the prince of the power of the air. The fall of Rome was a great defeat for Satan and it would affect his entire sphere of operation. He had tried to kill Jesus in his infancy through Rome under Herod, and he had failed. Satan then tried to kill the church in its infancy through Rome under the emperors, and once again he failed. Satan was the power behind Rome, and Satan’s complete defeat with regard to Rome will be described in detail when we get to Chapter 20. With the seventh bowl, God declares, “It is done!” His judgment is complete. The Greek word used here means “it has become” or “it has occurred.” Rome is finished! If what we see next in verse 18 comes as a surprise to you, then you just haven’t been paying attention! 18 And there were flashes of lightning, voices, peals of thunder, and a great earthquake such as had never been since men were on the earth, so great was that earthquake. 19 The great city was split into three parts, and the cities of the nations fell, and God remembered great Babylon, to make her drain the cup of the fury of his wrath. 20 And every island fled away, and no mountains were to be found; 21 and great hailstones, heavy as a hundred-weight, dropped on men from heaven, till men cursed God for the plague of the hail, so fearful was that plague. As usual, a great judgment of God is accompanied by lightning, thunder, and earthquakes. The purpose is to heighten the dramatic effect, and we have seen it many times before. This earthquake was “such as had never been since men were on the earth.” That is, this judgment is different from the previous judgments we have seen in this book. This judgment of the seventh bowl is God’s final word with regard to Rome. This judgment is total and complete. Since there had never been an empire like Rome, its collapse created an earthquake like none before. Therefore thus says the Lord GOD: Behold, I, even I, am against you; and I will execute judgments in the midst of you in the sight of the nations. And because of all your abominations I will do with you what I have never yet done, and the like of which I will never do again. And compare the description of God’s A.D. 70 judgment against Jerusalem in Matthew 24:21 ― “For then there will be great tribulation, such as has not been from the beginning of the world until now, no, and never will be.” Similar hyperbolic language is used here to describe another judgment against another great enemy of God’s people. • Micah 1:3–4 For behold, the Lord is coming forth out of his place, and will come down and tread upon the high places of the earth. And the mountains will melt under him and the valleys will be cleft, like wax before the fire, like waters poured down a steep place. • Psalm 18:7-13 Then the earth reeled and rocked; the foundations also of the mountains trembled and quaked, because he was angry. ... Out of the brightness before him there broke through his clouds hailstones and coals of fire. The Lord also thundered in the heavens, and the Most High uttered his voice, hailstones and coals of fire. • Ezekiel 26:18 Now shall the isles tremble in the day of thy fall; yea, the isles that are in the sea shall be troubled at thy departure. Verse 19 says that the city was divided into three parts. What does that mean? There are many opinions, but it may be borrowing language from the judgment of Jerusalem described in Ezekiel 5:2 ― “Thou shalt burn with fire a third part in the midst of the city, when the days of the siege are fulfilled: and thou shalt take a third part, and smite about it with a knife: and a third part thou shalt scatter in the wind; and I will draw out a sword after them.” There, as here, such language depicts the total destruction of the city. Verse 19 also tells us that Rome did not fall alone. The other cities of the nations fell with her. The entire pagan world is pictured as collapsing together. These cities had all drunk the wine of Rome’s fornication, and now they were suffering the consequences. With the seventh bowl God’s judgment against Rome and her allies is completed. The fall of the city will be described in more detail in Chapters 17 and 18. The battle at Armageddon will be described in more detail in Chapter 19. The defeat of Satan will be described in more detail in Chapter 20. Chapters 17 and 18 are an obituary for the great city of Babylon, which, as we have seen, can be none other but Rome. Babylon was said to have fallen in Chapter 14 and was broken into three pieces in Chapter 16. Chapters 17 and 18 provide the details of that fall. Recall that we discussed portions of Chapter 17 at length when we studied Chapter 13 because verses 7–18 of Chapter 17 provide an explanation of many of the symbols found in Chapter 13 and elsewhere in the book. We will not repeat here all that we said earlier. A main character in this chapter is a great harlot named Babylon the Great. Chapters 17 and 18 will provide the following descriptions of this harlot. Do they sound familiar? She is powerful (17:1, 3). She is successful (17:4). She is arrogant and proud (17:5). She sits on seven hills (17:9). She rules the world in John’s day (17:15, 18). She is a terrible persecutor of God’s people (17:6; 18:24). She is the leading commercial power on earth (18:3; 18:11-19). She is supported by a great military force (17:3, 7). She is destroyed in part by her own military power and inner strife (17:16-17). At the time this book was written, Rome was the only nation that fit each of these descriptions. Babylon is Rome ― and Babylon is fallen! In verse 1 we meet the great harlot who, like Jezebel in the Old Testament, has been actively seeking to murder God’s people. But, also like Jezebel, she has been judged, and we are about to see the details of that judgment. Verse 1 tells us that she is seated upon many waters. Later in verse 15 we will see that these waters are peoples and multitudes and nations and tongues. That she is seated upon them tells us that she rules over them. Which city ruled the world when this book was written? Jerusalem? Hardly. This harlot is Rome. Rome is being described here with Old Testament descriptions of ancient Babylon. For example, Jeremiah 51:13 addresses Babylon as “you who dwell by many waters” — and that was literally true for Babylon. The river Euphrates ran through the city, and it had irrigation canals extending out in every direction. Likewise, Jeremiah 51:7 describes Babylon as a “golden cup,” which we will here in verse 4 applied to Rome. And while we are talking about whether we should take these descriptions literally, what about the name of the city itself? Is this vision focused on the literal city of Babylon? The Greek historian Diodorus Siculus in the first century B.C. relates that only a small part of ancient Babylon was inhabited in his day. Strabo the Greek geographer who died in A.D. 19 describes Babylon as being “in great part deserted.” Pausanias the Greek traveler and geographer of the second century declares that nothing remained of Babylon except the temple of Belus and the walls of the city. 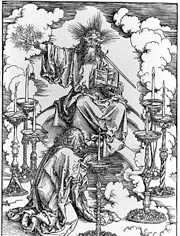 Lucian, the second century Greek sophist and satirist, said that Babylon would soon have to be searched for like Nineveh, of which not a trace remained in his day. Is that the great city John is writing about? Of course not! And that simple, indisputable historical fact establishes beyond any doubt that no one can take everything in this book literally. And once we agree that this book contains images and symbols, then under what theory do we say that Babylon is figurative but the 1000 years are literal? Verse 2 tells us that kings have committed fornication with this harlot. These kings have been her customers. Fornication in this context most likely means that these kingdoms have joined in with Rome and are on Rome’s side — some voluntarily and others not. In the Old Testament, disobedient cities are often called harlots. In Isaiah 23:17 we read that Tyre played the harlot with all of the kings of the earth. And in Nahum 3:4 we read that Nineveh betrayed nations with her harlotries. In Isaiah 1:21, the prophet, speaking of Jerusalem, writes “how the faithful city has become a harlot.” Ezekiel 16:15 says, “You trusted in your beauty and played the harlot.” Those fornications, like those of Rome, involved treacherous and deceitful relationships with other nations and with false gods all aimed at harming God’s people. Barclay notes that there is great symbolism behind these comparisons with a harlot. As John 3:16 reminds us, God so loved the world. “When we turn our backs upon God, it is not so much a sin against law as a sin against love.” A second aspect of the image likely points to the harlot as one who not only sins herself but who causes others to sin. These understandings combine to create a very powerful image. 3 And he carried me away in the Spirit into a wilderness, and I saw a woman sitting on a scarlet beast which was full of blasphemous names, and it had seven heads and ten horns. 4 The woman was arrayed in purple and scarlet, and bedecked with gold and jewels and pearls, holding in her hand a golden cup full of abominations and the impurities of her fornication; 5 and on her forehead was written a name of mystery: “Babylon the great, mother of harlots and of earth’s abominations.” 6a And I saw the woman, drunk with the blood of the saints and the blood of the martyrs of Jesus. In verse 3 John is carried away into the wilderness. Over and over again the Bible, men such as Moses, Elijah, and John the Baptist meet God in the wilderness. If our lives are too busy and too noisy to hear the voice of God in his word, then perhaps we need to go out into the wilderness (which might just mean that we turn off our TV and our phone for an hour!). In Chapter 12 the people of God were pictured as a woman chased into the wilderness by an angry dragon. The woman John sees here in Chapter 17 is also in the wilderness, but as we will see she is quite different from the woman of Chapter 12. This woman sits upon a scarlet beast that is full of blasphemous names and that has seven heads and ten horns. We discussed these images at length in our discussions of Chapter 13. This beast appears to be the same beast from the sea in Chapter 13, which represented Rome as a civil persecuting power. The harlot is dressed in purple and scarlet, and she is arrayed with gold, jewels, and pearls. These images denote her wealth and her royalty. Rome was powerful in earthly terms. Rome was royal in earthly terms. Rome was rich in earthly terms. Rome was beautiful in earthly terms. And all of those descriptions were true of a great kingdom of John’s day — but that great kingdom was not Rome! God tells us that is was the church and not Rome that was truly powerful and royal and rich and beautiful. Things are not always what they seem! The harlot offers a golden cup to the other nations. This description is likely an allusion to a description of the actual Babylon found in Jeremiah 51:7 ― “Babylon was a golden cup in the Lord’s hand, making all the earth drunken; the nations drank of her wine, therefore the nations went mad.” The nations that shared Rome’s wealth also shared Rome’s guilt. The mystery in verse 5 is simply that Babylon means Rome. The harlot wears on her forehead the name “Babylon the great, mother of harlots and of earth’s abominations.” She wears this horrible title proudly just as the High Priest wore the name of Jehovah upon his forehead. Rome was proud of its abominations and fornications and made no attempt to hide them. She displayed them proudly for all to see. There is also a historical connection with this description: a Roman prostitute in a public brothel wore a frontlet upon her forehead that displayed her name to the customers. Barclay thinks that these verses may have an even more precise historical allusion in mind. The Roman Empress Messalina was the wife of the Emperor Claudius, who preceded Nero. Have you ever met someone in authority and wondered how he got there ― and then you met his wife and understood? That may have been the case with Claudius. The historian Suetonius described Claudius in this way: “His knees were weak and gave way under him and his head shook. He stammered and his speech was confused. He slobbered and his nose ran when he was excited.” From this description of Claudius’ weakness, we can gather that Messalina was likely very powerful and influential, which was true up until the time when Claudius had her killed for plotting against him. In any event, Juvenal tells us that at night she would go down to the public brothels and serve there as a common prostitute. This description of Rome as a harlot would have rung a bell of recognition with anyone who remembered Messalina. This harlot is vividly pictured as being drunk with the blood of saints and martyrs. She is not just an ordinary persecutor. Instead, she is glutted with slaughter, and she has revelled in that slaughter as a drunken man revels in his wine and drunkenness. 6b When I saw her I marveled greatly. 7 But the angel said to me, “Why marvel? I will tell you the mystery of the woman, and of the beast with seven heads and ten horns that carries her. The mystery of these symbols was something that was previously not understood but that will now be revealed. Throughout this explanation we should reverse the rule that we have been using throughout our study of this book; that is, we should accept the explanation as literal unless there is an overriding reason to treat it otherwise. Why? Because the angel is explaining the apocalyptic language we have seen rather than giving us additional apocalyptic language. Many commentators have trouble with these verses because the angel’s interpretation does not match their own. Their response often involves figurizing all or part of the angel’s interpretation. In fact, some commentators have things so backwards that they treat the image as a literal description and the explanation of the image as a figurative description! 8 The beast that you saw was, and is not, and is to ascend from the bottomless pit and go to perdition; and the dwellers on earth whose names have not been written in the book of life from the foundation of the world, will marvel to behold the beast, because it was and is not and is to come. We have already discussed the bottomless pit and the book of life. We have also already discussed this beast, which represents Rome as a civil persecuting power. Recall that the time when “the beast was” denotes the persecution under Nero, the time when “the beast is not” denotes the lull in persecution between Nero and Domitian, and the time when “the beast is to come” denotes the resumption of persecution under Domitian, who was called Nero Redivivus by some. Nero was the first to actively persecute the Church. The persecution had subsided considerably when the book was written during Vespasian’s rule. But the persecution began again under Domitian’s reign. Juvenal said that Rome under Domitian was enslaved to a “bald-headed Nero.” Tertullian called Domitian “a man of Nero’s type of cruelty” and “a sub-Nero.” Domitian renewed the persecution against Christians that Nero had started. 9 This calls for a mind with wisdom: the seven heads are seven mountains on which the woman is seated; 10 they are also seven kings, five of whom have fallen, one is, the other has not yet come, and when he comes he must remain only a little while. 11 As for the beast that was and is not, it is an eighth but it belongs to the seven, and it goes to perdition. We have already discussed these verses at great length in our comments on Chapter 13. The five kings who have fallen are Augustus, Tiberius, Caligula, Claudius, and Nero. Galba, Otho, and Vitellius (who followed Nero and who all ruled and died within about one year) are ignored in Revelation (but not in Daniel, which describes them as three uprooted horns). The king “who is” is Vespasian, which means the book was written during his reign. The one who will come and reign only a short time is Titus who ruled for only 2 years. (And no one would have guessed that Titus would reign only a short time. He was only 39 when he became emperor, and the people all expected him to reign for a very long time. But God knew otherwise, and soon Titus’ younger brother, Domitian, was emperor in his place.) The eighth king is Domitian, who began where Nero left off with regard to persecuting the church. Again, we discussed these verses at length in our study of Chapter 13. 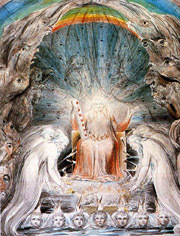 We discussed several views regarding the 10 horns and the 10 kings, which we will not repeat here. Whatever they represent, verse 14 tells us something important about the 10 horns: “the Lamb will conquer them, for he is Lord of lords and King of kings, and those with him are called and chosen and faithful.” Did Jesus’ victory over these 10 horns make Jesus Lord of lords and King of kings? No. We are told that he conquered them because he is Lord of lords and King of kings. Jesus’ victory over Rome and Rome’s minions did not make Jesus king. Jesus was already king! And there is a lesson in that for us. How often do we hear denominational preachers tell people that they need to make Jesus lord of their life? How often do denominational songs (some sadly in our own songbook) tell people they they need to crown Jesus king? There is not a shred of support in the Bible for such a notion — and yet we continue to hear it and sing it. When Peter was asked “Men and brethren, what shall we do?” in Acts 2:37, he did not tell them they needed to make Jesus lord of their life. In fact, that would have made absolutely no sense. Why? Because he had just told them in Acts 2:36 that “God hath made that same Jesus, whom ye have crucified, both Lord and Christ.” Instead, Peter told them that they needed to obey their Lord; they needed to “repent, and be baptized every one of you in the name of Jesus Christ for the remission of sins.” (Acts 2:38) Jesus is Lord of lords, which means he is everyone’s Lord. Jesus is King of kings, which means he is everyone’s King. The next time you see the word “king” or “lord” in a song, pause and consider just what it is you are being asked to sing! Nowhere in Revelation does Jesus begin to rule over something new. He has all authority when the book begins, and he has all authority when the book ends. He reigns over the entire universe when the book begins, and he reigns over the entire universe when the book ends. He is King of kings and Lord of lords when the book begins, and he is King of kings and Lord of lords when the book ends. Do we see new expressions of that reign in this book? Yes. But do we see in this book Christ reigning over something or someone that he he did not previously reign over? No.